The theme for Lasang Pinoy 9 for the month of April, hosted by Cia, is Lamang-loob: Odd Cuts and Guts, lamang-loob being offal, the internal organs of your preferred animal. I dare say Filipino cuisine is indeed redolent with dishes containing lamang loob. This is related to Filipinos being very economical. Once an animal is slaughtered (for family consumption purposes, which happen during fiestas and family events), all parts and pieces are utilized, not a single part goes to waste. So we have such Filipino mainstays as papaítan (thin slices of goat innards cooked in calamansi juice and bile), igadó (chopped pig intestines cooked in vinegar and soy sauce), bópis (minced pig lungs cooked in spiced vinegar), sísig (pan-fried chopped pig ears and chicken liver), dinakdákan (boiled and grilled pig ears and brain), even karé-karé (oxtail and tripe in peanut sauce and fermented shrimp fry) and adóbo of chicken liver and gizzard. And we also have tomato stews with Spanish influences, like menúdo (pork meat and liver), callos (tripe), lengua (ox tongue). I've cooked some of these, ironically the Filipino ones I haven't, though I've watched countless washings of intestines in our backyard. Preparation and cooking are usually undertaken by male cooks, and I leave it at that. Especially since I fear buying innards in the market. And so my contribution to LP9 is quite a common dish in Pangasinan, albeit probably unknown outside the province. It is siningang na bangós, with all the fish innards (except the gills and bile) thrown in the soup for flavor. Bonuan bangós (milkfish coming from ponds cultivated in the coastal barrio of Bonuan in Dagupan City) has quite a legendary status in Pangasinan, and such worship is entirely deserving. No other bangós, whether cultivated in the province or elsewhere, tastes like it. True to its name, the flesh is milky and sweetish, the fat in the belly inducing nirvana. There are less bones and those pesky thread-like spines, and there is never a fishy hint in taste. Like eating pure cream in the form of soft fish flesh. Of course it follows that the innards of the bangós are as milky and as fresh-tasting as well. 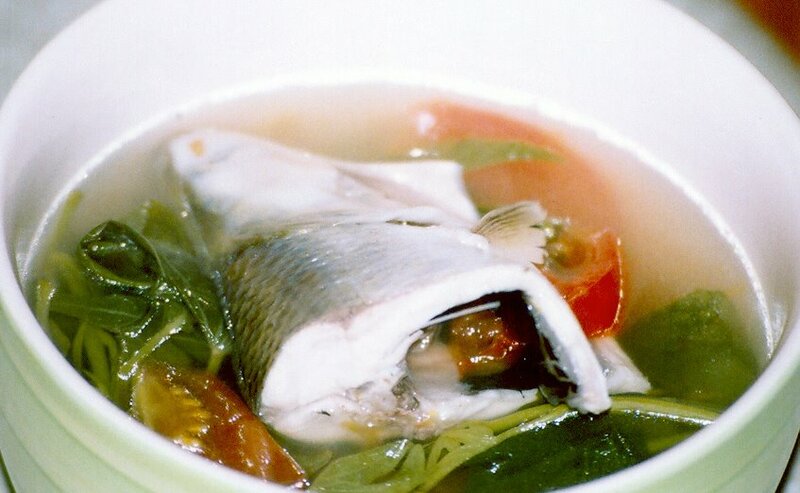 Pangasinenses and Ilocanos have a habit of flavoring soups (including tinóla) with bagóong (salted, fermented anchovies). In a sinigáng, the bangós innards take the place of the bagóong, and you have a very flavorful, quite tasty soup. Even insęlar a oráng (sinigang na hipon or shrimp in soured soup) uses bangós innards for flavor. Restaurants along the beaches in Dagupan City cook sinigáng this way, particularly the famous Matutina chain of Pangasinan seafood casual dining. To cook, fresh Bonuan bangós is sliced and put in a simmering pot of water flavored with a peeled ginger the size of your thumb, chopped tomatoes, sliced onions, salt and the innards, and calamansi juice (optional). When the fish flesh has turned opaque, add some kamote tops and continue cooking till the leaves are tender. Do not overcook so the fat will not disintegrate (very important!). May I just add a note that it is critical to use fresh bangós, preferably newly harvested, and cook straight from the wet market. Never use previously frozen fish. If you only have access to the latter, it may be prudent to discard the innards. Hahaha, Ms. Matabang Pusa, I can't even remember what our block number was so I can't confirm, haha! But yes, it's definitely me, your charming (hehe) blockmate at CW. Will be in QC for a year by May, will let you both know so we can relive the good ol days. I'm itching for Rodics and CASAA! Yes, rice washing is added to sinigang, though I don't think it adds more to the flavor. The add-in factor is in terms of the nutrients from the washed rice. Iska, you made me remember my bihod entry. Thanks!